The Family 4 Berth Standard Motor Home is a tried and proven winner - comfortable, easy to drive and very economical. 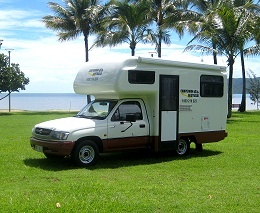 The Motor Home is a fully moulded 17 foot fibreglass Matilda Motorhome body based on a proven economical 2.4 unleaded five speed manual 1999-2003 model Toyota Hilux cab chassis. The Standard differs from the Deluxe in that it doesn't have air-conditioning in the sleeping area, and doesn't have a toilet or shower. 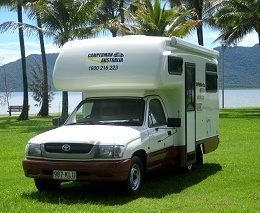 Travel all over the country with us in this award winning Motor Home for an enjoyable holiday.